The generic term “MMF” classifies a number of different types of flooring. In January 2019, the Multilayer Modular Flooring Association (MMFA) assigned new names to product groups in the market, thereby making a clear commitment to bring together all the various terms used within the sector. The same system of classification will be retained, with multilayer flooring still grouped according to its type of construction. However, from November 2018, the Association has been working with the new product categories “Wood”, “Polymer” (which is divided into “LVT” and “Rigid”) and “Mixed”. Product ranges are becoming increasingly diverse and complex, with new product developments in the industry showing no sign of slowing down. In January 2018, the MMFA Association revised the way it differentiated between Product Classes 1, 2 and 3 to take the latest product developments into account. In simple terms, Class 1 previously denoted HDF-based products, Class 2 polymer-based and Class 3 special constructions. Class 2 has now been broken down into sub-groups 2A (classic LVT Click products) and 2B predominantly products with an extruded core layer, often classified as “rigid boards”. To include newcomers to the market in a systematic way, in-depth discussions were held to put an end to the “Class” system for the future. “We are retaining a classification system for individual MMF products, but we have moved away from the concept of Classes 1, 2 and 3. This comes as a result of our belief that such a classification could be misconstrued as a product ranking,” explained Sebastian Wendel, Vice-President of the MMFA and Chairman of the Technical Committee. Going forward, the association will be categorising products according to MMF construction – i.e. wood, polymer or mixed. Under “Polymer”, we will still distinguish between classic LVT Click products and “Rigid” EPC or SPC-based products. 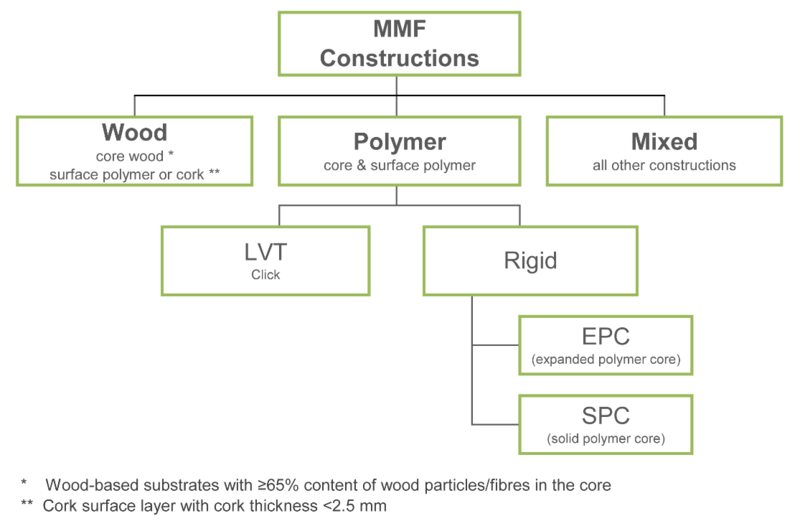 The new MMF categories include Wood, Polymer, and Mixed (this applies to all flooring constructions not covered by any other category or by own external standards, such as modules using the click system with a textile top layer). Comment from SA industry – Is it time to change how we categorise multilayer products? Chris Holden from Finfloor says that due to the ever changing landscape with various cross over products now competing against each other, it is about time that the grading systems/groupings are updated and changed to fall in line with the technical and performance changes/developments. “Class 1 – HDF products – traditionally decorative laminates, perhaps needs to revisit the fit for use grading system, as some developments have taken these products into the realm of Vinyl products. Class 2 – I agree with the creation of two perhaps even three sub- groups, to take the confusion out the consumers head, i.e. click LVT, sheet glue down vinyl and rigid core vinyl, as the performance standards on these vary hugely. It may also be an opportunity to relook at some of the grading systems used. Class 3 – Mixed is very vague and can cover engineered/bamboo etc. This would need to be specified. Apart from these distinctions, it would still be a good move for the industry,” says Chris. Full thanks and acknowledgement are given to www.mmfa.eu and www.finfloor.co.za for the information contained in this article.